1. Chicken: Cover the chicken breasts with plastic wrap and pound until each pieces is about a ¾ of an inch thick. (NOTE: If your chicken breasts are really thick,you can just cut them in half horizontally to make thinner pieces rather than pounding. Works like a charm.) Place the flour and salt and pepper in a shallow dish and gently toss each chicken breast in the dish to coat. Melt the butter in a large skillet over medium high heat; add the chicken and saute for 3-5 minutes on each side, until golden brown, sprinkling each side with the lemon pepper directly in the pan. When the chicken is golden brown and cooked through, transfer to a plate. 2. Asparagus and Lemons: Add the chopped asparagus to the pan. Saute for a few minutes until bright green and tender crisp. Remove from the pan and set aside. 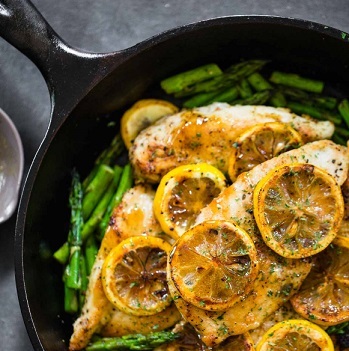 Lay the lemon slices flat on the bottom of the pan and cook for a few minutes on each side without stirring so that they caramelize and pick up the browned bits left in the pan from the chicken and butter. (NOTE: adding a tiny pat of butter in with the lemons also helps prevent sticking and promote browning.) Remove the lemons from the pan and set aside. 3. Assembly: Layer all the ingredients back into the skillet - asparagus, chicken, and lemon slices on top. For the honey butter sauce, I just melted additional butter and honey in the hot pan after caramelizing the lemons and poured it over the chicken. This mixture definitely picked up some of the residual lemon flavor from the pan, so if that isn't your thing, be sure to melt the butter and honey in a separate pan.